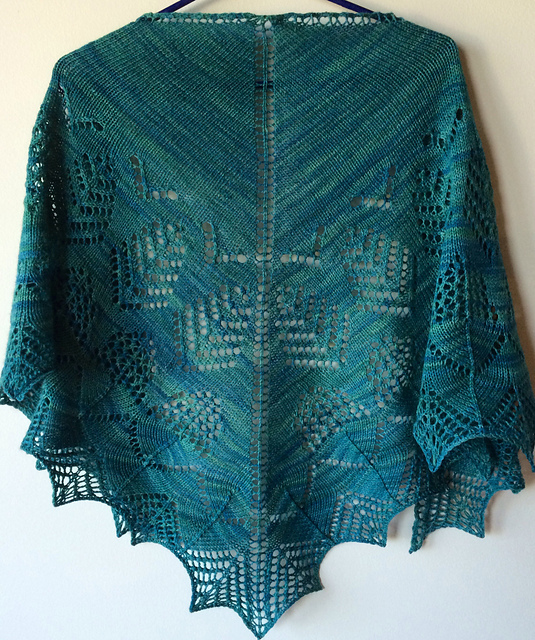 This wonderful and cosy Dear Green Shawl pattern has been generously donated to the p/hop project by the very talented Anna Fisk (aka narnie83 on Ravelry). 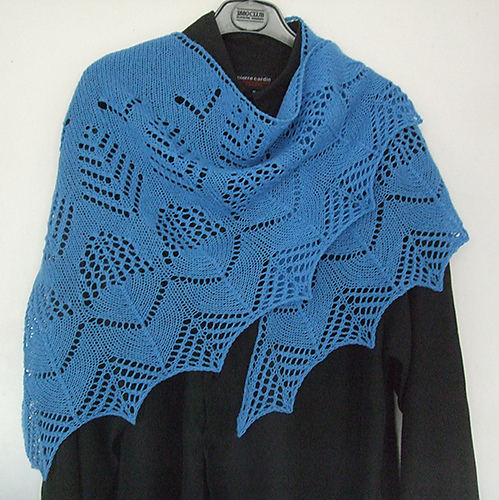 Anna submitted this shawl into the Design Competition at Glasgow School of Yarn in 2012 and won a prize with it. We are honoured to have a prize winning shawl amongst our patterns. I love living in Glasgow, but in the winter months, with the relentless rain, cold and darkness, can take their toll. So I’ve designed a cosy behemoth of a shawl which I can wrap around me like a massive hug, reminding myself the reasons why I adore this city. The shawl uses lace motifs representing a bird in flight, a tree, and a bell, ending with the traditional ‘Shetland’ fishtail lace pattern. My version is worked in a colourway reminiscent of the view of the trees I could see from my window or walking along Queen Margaret bridge in the early autumn: leaves predominately green, with flecks of orange and gold. Dear “Blue” Shawl knitted by SuLam as a sample for p/hop – thanks Su! To keep up-to-date with the latest p/hop news including new pattern announcements follow us on twitter, join our Facebook group, join the p/hop group on Ravelry or bookmark this website.